The Junin region, in the heart of the rainforest, is one of the poorest regions in Peru, a country where poverty goes hand in hand with a lack of education. In the tiny commune of Sondoveni, 120 schoolchildren currently receive their lessons in three classrooms right until their 5th school year. Here, a teacher has to teach five class levels at the same time. Like most parts of this region, these children no longer have the chance to attend a secondary school afterwards. The atsipatari project (joint) has committed to changing this situation. “The six weeks in the Peruvian rainforest was an unbelievably exciting and moving experience for us students from Stuttgart and Lima universities, and one which left a significant impression on us all. Although we struggled greatly with the climate conditions at the start, we are very proud and happy that we saw the project through to its end. In time, we also learned how to get used to the rain and the Latin American way of working”. And the result is impressive. 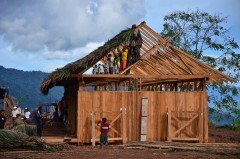 As planned, a secondary school for children and youngsters from the surrounding area now stands on the former helicopter landing site in Sondoveni. Both parts of the building house two classrooms, a library, a large dining/common room with an open kitchen and sanitary facilities with toilets, wash basins, and showers. 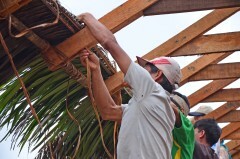 To accomplish all this in six weeks, we had to rely on our own strength and determination, but also received huge help from the residents, who built the entire roof and covered it with palm leaves. 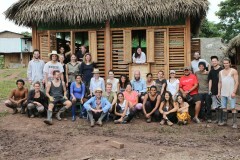 The rainforest became our home for six weeks. We originally stayed in Satipo, a smaller town. 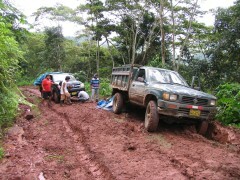 However, as the journey to the construction site was taking one and a half hours, and in bad weather, we were sometimes unable to get up the muddy road, most of the group members stayed in Sondoveni. We went back to Satipo now and then only to shower. Without electricity and hot water, thus with camp fires, tarantulas, and a never-ending onslaught of mosquitoes, the days up high at an elevation of some 1,200 metres, flew by. Even if the construction site and works did not run entirely according to the schedule drawn up in Germany, we still managed to open the school in the end and we are extremely proud of this fact. 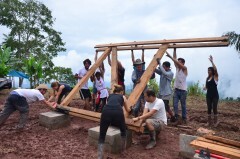 In addition to a number of new skills and knowledge in the field of timber construction, organisation, and Latin American culture, we also got to know a lot of lovely people. And completing this project with the students from Lima and the local residents was an unforgettable experience. We are eternally grateful for the support from Germany. Without it, this project could never have gone ahead in the first place. Without the assistance of the Peruvian students, who welcomed us with open arms, we would never have made it this far. They have shown us the beauty of their country. 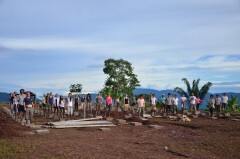 The residents of Sondoveni also showed their full dedication and commitment. Finally, we are basically grateful that everyone who took part came back from Peru healthy, happy, and unharmed (except for a few insect bites :)).